Ubuntu and Android have been close friends for a while now, but developers have been working to make Ubuntu it’s own mobile OS and that work was revealed today. Using the Galaxy Nexus, the new totally gesture-based operating system was shown off today and looks like a fledgling OS with a lot of promise. You thought Google was crazy for having on-screen home buttons? This operating system has no home button whatsoever. The Verge got some facetime with developer devices today and put up a quick video showing off a few of the features. Unlocking the phone just takes a swipe to the right, and swiping to the left brings up a slick list of most-used apps. Once you’re in the phone’s home screen swiping right will take you to the most recently open app, left again brings up most-used. Swiping down from the top brings down an Android-style notification bar, but the information changes depending on which icon you swipe down from. You can check messages, battery life and settings all from different swipe points. There is some noticeable lag throughout the phone, but that’s to be expected with the early build that it’s running. Once that gets cleared up it looks like it could be a pretty slick user interface. Images for the Galaxy Nexus are going to be available for download in “the next few weeks” so developers can tinker and start building apps and an ecosystem for the new OS. 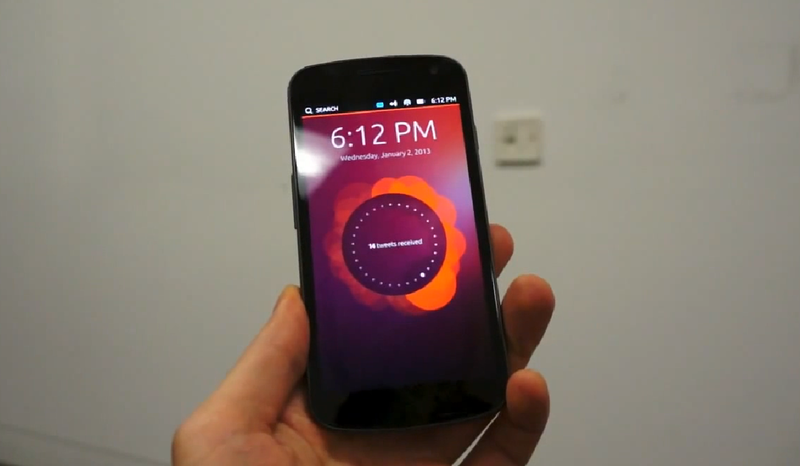 Ubuntu for Android is even closer now after today’s news, would you be interested in using this as a parallel OS in your phone?